For as long as I can remember, I've added sugar to my tomato sauce. Whether I'm making something quick or an all day affair, I've used sugar to cut down on the acidity from the tomatoes. The other day, I decided to try something different. 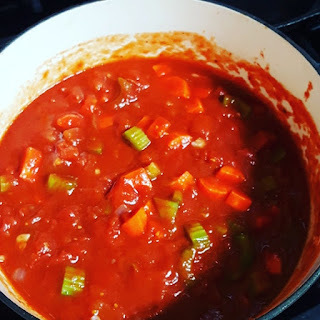 Instead of the usual sugar, I added some carrots to the sauce. The naturally sweet carrots took care of the job the sugar usually performs, and added some extra nutrients too! In a heavy bottom stock pot, sauté the onions and garlic in olive oil over medium-high heat. Add in the remaining ingredients. The high heat method, which can be little risky, but can make the in less than an hour. Bring the sauce to a simmer over medium-high heat and simmer for 30 minutes. Be careful with the high heat method, because tomatoes can burn very easily. just make sure to stir the sauce often to prevent burning. The low heat method, which is definitely the safer route. Once the onions and garlic are ready, reduce to the heat to low. Let the sauce simmer for 6 to 8 hours, stirring occasionally. The low heat method will allow all of the ingredients to break down and help the flavors come together, without the risk of burning. Either way, I like to use a heat diffuser with my sauce, to help evenly distribute the heat around the bottom of the pot. Once the sauce is cooked, I like to blend everything together with an immersion blender, to break down all the large pieces.